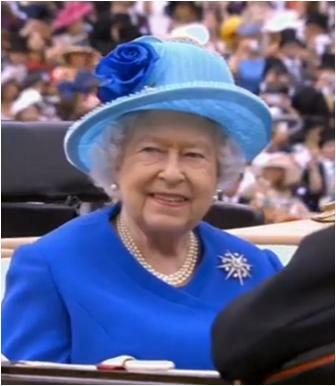 Royal Ascot ends how it began: with one of The Queen's favorite brooches. It ends on a high note for The Queen, too: after needing to put down one of her horses following an accident earlier in the week, she had a winner today! Her horse Dartmouth won the Hardwicke Stakes. Her outfit today is a repeat from her arrival in Germany last year, with a hat by Angela Kelly and a coat and dress by Peter Enrione. Enrione, 74 and known to The Queen as "Mr. Peter", has been Her Maj's tailor since the 1980s and still works up her outfits on his pre-war sewing machine. The Prince of Wales and The Duchess of Cornwall are really into Royal Ascot this year - which, obviously, I love - and they were present to watch another of their horses race today. 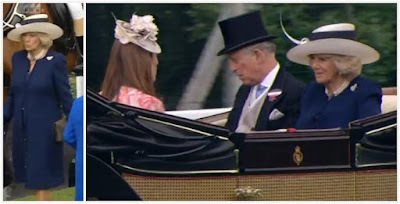 This is really one of the best hats in Camilla's collection, don't you think? Very classic, very sharp. And very many bonus points to her for managing to squeeze in some Ascot brooch fun of her own ! From a brooch perspective: We're halfway through the year and we haven't had that many brooch surprises, so I'm doubly glad that Ascot gave us something new. The Cartier Diamond Rose Clip Brooch is one of the prettiest brooches she's debuted in recent years, and it will stand as my highlight from Ascot 2016. From an outfit perspective: We're not going to forget that orange and blue number anytime soon, are we?! I have to give it to Angela Kelly on Day 2 also, I like that budding branch embellishment more every time I look at it. What are your highlights from this year?